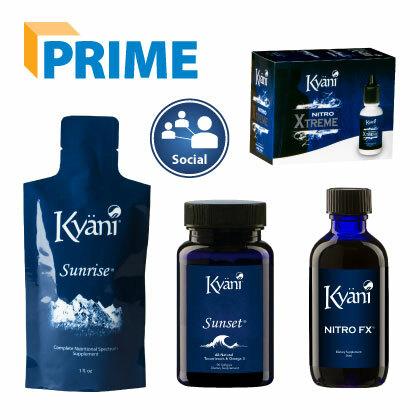 Kyani Social Product Pack - Buy Wholesale & Save! This basic enrollment pack includes all of the Kyani prime products included in the Kyani Product Pack plus a three month membership in the Kyani Social program. Every business person needs to keep meticulous records to effectively manage their enterprise. That is exactly what Kyani Social can do for you as well as a host of other business needs. This includes communications with up-line and down-line contact throughout the Kyani team, important notifications, sales volume, training opportunities, effectiveness of marketing strategies, links to Kyani home events and customer prospects, calendar tracking by day, week, or month, and much, much more. Kyani Social is a treasure trove of tips, tools, and information that will help you through every step of your business development. After the initial three months membership in Kyani Social, your membership will be automatically renewed at a discounted monthly cost. As valuable and informative as Kyani Social is, membership is not mandatory, and you can cancel your membership at any time. This pack is available in Australia for only $692.00. What Does the Social Product Pack Contain? How Can You Buy the Kyani Social Product Pack? All orders are shipped fast from your LOCAL distribution centre. For example, Australian orders are shipped from Sydney and New Zealand orders from Auckland.